It is day 4 of December which means we are on a delicious countdown to Christmas! 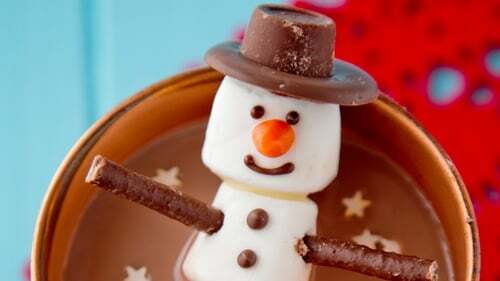 Every day this month, we will share some of our most Christmassy and festive recipes such as this snowman hot chocolate. 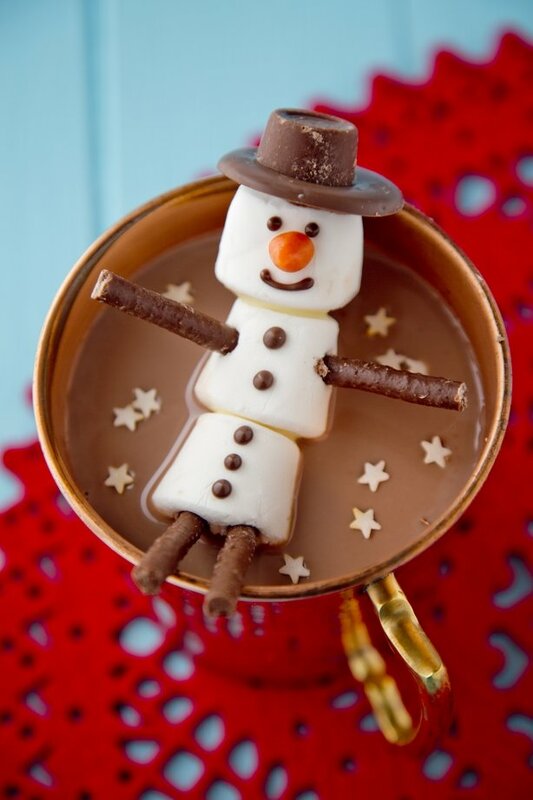 Delicious and Christmassy snowman hot chocolate! In a small plastic bowl melt 15g of dark chocolate for 30 seconds on a low heat in the microwave. Stir and repeat until the chocolate is completely melted. Fill a small disposable piping bag with the melted chocolate. First, make the snowman’s hat. Pipe a small amount of the melted chocolate onto the rolos and then stick it onto the large chocolate button. Put into the fridge on a plate to harden for a few minutes. Pipe a tiny bit of melted chocolate onto the bottom of two marshmallows and the stick the 3 marshmallows together. Place them on to a plate. Then pipe the snowman’s eyes, nose, mouth and buttons with the chocolate. Place another tiny bit of chocolate on the snowman head and stick his hat to it. Roll a small piece of orange icing into a carrot shape to make his nose and place it on top of the chocolate. Then put into the fridge for 10 minutes to allow the chocolate to set. Cut the chocolate sticks in half and stick into the middle marshmallow and the bottom for the arms and legs. Pour the milk and honey into a small saucepan. Add in the chocolate and cook over a medium heat. Stir with a wooden spoon until the chocolate is melted. Then whisk until the mixture is warm and smooth. Pour into a mug and decorate with a snowman marshmallow. Recipe courtesy of FoodOppi - Louise Lennox & Aisling Larkin.